Providin' positive & productive ways to resist the zombie virus with daily doses of pirate motivation. We wish to be absolutely clear that when we speak of “pirates”, we are not talking about rogues on the high-seas — nor are we talking about illegal downloaders either. We do not support or condone such activities. When we speak of pirates, we are talking about a completely new generation of individuals — maximizers of potential. In our view, a pirate is a person whose talk, enthusiasm, or energy causes others to be more friendly, enthusiastic, or energetic. Pirates are passionate people with a sense of purpose — and people who precipitate a positive events or changes. Note: If you don’t recognize the context in which a word is used, it may help you to refer to our glossary of terms. Pirates are captains of their ship. They take responsibility for their own lives. Pirates take action & set sail — navigating with intent towards their dreams. Pirates are optimistic in their outlook and resist cynicism & negativity. Pirates often have magnetic personalities — they make you feel that you are great and may even inspire you to even greater levels of greatness — pirates are motivators & gateways on the path of life. Pirates live with integrity (a departure from the “classic” view of pirates, but hey — work with me here). Pirates are passionate & enthusiastic. Pirates exhibit signs of free & independent thinking. 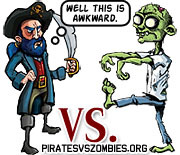 Pirates may refer to — but do not rely on — the “zombie collective” to form an opinion. Pirates are capable of making bold & brave decisions and calculated risks. Pirates are not afraid of making mistakes — as mistakes are just learning opportunities. Pirates are compassionate & avoid value judgements. People are neither purely “good” or “bad” — they simply make wise or unwise decisions. Pirates sail on the Sea of Serendipity — often attracting positive meaningful coincidences into their lives. Pirates swim in the Ocean of Opportunities — pirates tend to see opportunities everywhere — even (and especially) in times of crisis. Pirates strive for excellence & consistency, not perfection. Pirates resolve to do what is hard & necessary vs. what is quick & easy. There are no shortcuts to success or special pills one can take that miraculously make things easier or cause problems to disappear. Pirates appreciate entertainment (TV, video games, movies…) with moderation. Pirates use entertainment as a way to be social, be active, or simply relax (again, without excess). Click here for details about Zero Dean's new book!